The number of people connected to the web is always growing. To boot, the search engine landscape is constantly changing. With new websites and more consumers sprouting up every day, it’s important for you to keep up with the trend. You need to know how to dominate the search engines. Part of that is understanding how Google is looking at content. Supposedly, Google is prioritizing the most relevant content at the top, but if you’ve seen Google lately, you’ll know that it doesn’t always do the best job of this. Googles evolved a lot over the years in how it reads words and applies contextual analysis. It used to define relevancy by keywords, but that’s no longer the case. Keywords and backlinks aren’t the end-all be-all to your search rankings anymore (but don’t get me wrong, the science of keywords + your link profile still matter most). This is where topical authority comes into play. At first thought Topical Authority may seem like it only matters for your money site, but topical authority is also another way of looking at a backlink. Are you getting backlinks from sites that have a certain amount of topical authority on a subject or do you just get a guest post or PBN link without a 2nd thought? Understanding what topical authority is, and how to establish it for yourself, is the key to succeeding on Google in 2019 and beyond. Topical Authority is the new layer to Google Authority. Before you can build your Topical Authority, you need to know what it is. The easiest way to understand it is in relation to other types of authority that have existed before. Let’s say you write a blog post and you optimize it to rank. You found a low competition keyword, write an engaging post on it, and dress it up in SEO. The page ranks in no time, and you’re thrilled. This means you’ve established Page Authority (PA) for that page. You can actually check what your page authority score is (from 0 – 100) for any given page on your site through tools like Raven Tools (as it aggregated Moz and Majestic Domain and page data) or through a tool like Ahrefs. But just because you’ve established page authority doesn’t mean your entire site is ranking well. You’ll also want to grow your Domain Authority. When you have several pages on your site ranking, that’s usually a sign that you’ve achieved Domain Authority. You can also check this for sure using Raven Tools. In Moz’s words, since this term was created by Moz, “The actual Domain Authority calculation itself uses a machine learning model to predictively find a “best fit” algorithm that most closely correlates our link data with rankings across thousands of actual search results that we use as standards to scale against.” So its only natural to then ask: How do I influence DA? But, lets say you have external sites linking back to yours and your content is quality. This tells Google that you’re an authority for your keywords. This pushes you up the search rankings. Links and keywords have long been the holy grail of SEO, but Topical Authority adds a new layer to this system. Google figured out that just because a site is ranking for keywords doesn’t mean its users are finding the answers they were looking for. This brought up a relevancy issue. Are keywords really doing the job they’re intended to do? The answer is no, not fully, but hey, its better than just relying purely on backlinks and anchor text. So Google released the Hummingbird update in 2013 to start diving deeper into the intent behind the search queries. It started to see that people weren’t searching for keywords. They were searching for answers. And this means the algorithm needs to consider semantics and context. Google found its fix, but as a site owner you need your own. Topical Authority is the answer to the relevancy issue. Google isn’t going to give you authority based on keywords alone anymore. Now you need to show Google that you can holistically cover a topic as an expert. This isn’t to say that you can’t rank for something like “The best vaccuum cleaner in the world” as a gardening company, but you’ll have a more difficult time gaining traction from a site that has very little reason to talk about a certain subject. Your money or your life topics are especially true of this. So how do you gain authority? It might seem like a big undertaking at first, but with some strategic planning, you can win. Following are the key areas you want to focus on with your content to build topical authority. The first step to any winning SEO strategy is to find optimal content opportunities. Establishing Topical Authority is no different. This requires a research phase that – if done right – will yield high traffic results. Question Number 1: Are you missing the first step to keyword research? Google is treating search queries like questions now. This is incredibly important to consider moving forward. Most keyword research guides will tell you to dive into keyword tools like SEMrush first. The missing first step is actually to find out what questions your audience is asking. If you’re missing this first step, you’ve got a big opportunity gap to fill. How else will you know that your articles are answering relevant questions? Make a list of 10+ questions your audience is asking about your umbrella topic. If you’re struggling to come up with questions, find a forum or an FAQ that identifies some questions for you within an industry you’re trying to niche down in, and go from there. Do local businesses need social media marketing? How do I grow an audience on social media? How do I measure ROI from social media marketing? How do I get engagement on Instagram? Question Number 2: Are you taking inventory of your existing content? You want to take inventory of your site’s content to see what’s hitting the mark. For the sake of opportunity, you also want to see what pages you can improve upon. First, you want to set a goal. Decide how you want your blog content to perform. And while you’re taking inventory, see what you could be doing better. Then you can optimize the pages you want to improve upon. If you want the easy route, you can use Raven Tools. The SEO tool crawls your entire site for opportunities and errors. Click here to try it out for free. Question Number 3: Are you watching your competitors? Another great way to find content opportunities is by keeping an eye on the competition. If they’re creating certain kinds of blog content and ranking well, you can do the same. Also, peek at their weaknesses. They might have holes in their content, and you can beat them out with your own. Use tools like Ahrefs to find out exactly what keywords your competitors rank for. Are you ranking for the same? If not, it’s time to get to work. Create content around the same keywords your competitors are ranking for (as long as they are relevant to your business and audience). Make it longer than the original – but not unnecessarily long. Make it more up-to-date. Even the date of the article itself will help. Make it more visually compelling using mixed media. Add videos and images to your article (Often times videos or images can assist in ranking for certain keywords anyway). Make it more in-depth. Answer the queries that lead to your article on a deeper level. Give the full step-by-step answer. Delve into all possible insight. The “Skyscraper Technique” – coined by Brian Dean of Backlinko – has a competitive hack. If you look at any of that dudes content, you’ll need a couple coffees and an entire weekend to finish some of his guides. Keep in mind that, while this can be powerful, it can also be over the top and unnecessary to rank or to just engage your audience. When you create your more updated, more thorough, more engaging article, reach out. You can use Raven Tools to see what sites are linking back to your competitor. Then, just reach out to those site owners and offer up your article as an updated version of the one they have. Of course not everyone will say yes. Still, this is a surefire method for building authority with a competitive strategy. While writing your competitive pieces, make sure you make your content unique. The last thing you want to do is copy their content. Instead, mirror their quality backlinks. If they have a backlink from Huffington Post, you want a similar one for your site. But, the focus is on creating fresh content that answers the same queries on a deeper level. Long-tail queries are low volume, high-converting queries from Google’s users, such as, “where to find a great writer” or “best italian restaurants in LA”. These users have the most specific questions in mind and are going after exactly what they want. When you appeal to long-tail keywords, you can easily start ranking on Google. This uptick in traffic will build topical authority when you couple it with the next section. The easiest way to find long tail keywords is by using Google itself. Start typing in one of your focus keyword and see what Google autofills. Usually, it’ll be a long-tail keyword waiting for you to take advantage of its search power. Also, if you scroll to the bottom of search results, you’ll see a “Searches Related To..” field that will return long-tail keywords. Then you can create or update your content around long-tail keywords. You can use long-tail keywords to rank Spoke articles (which we’ll get to in the next section). The higher you rank these articles, the better your topical authority will be. So far you’ve discovered some of the individual keys to topical authority. But what about a rock-solid blog strategy to put the big picture together? You might think you just need to release a bunch of blog content around your topic. According to the questions-answers methodology, this makes sense. You could take that list of questions from before and write long-form articles for each. Should do the trick right? The truth is, that’s about half the battle. To have topical authority, you need to show Google enough of a signal to demonstrate a general environment that is in the ballpark of the keyword you want to rank for. You can write on plenty of subtopics but it always works best to only write about things with search volume, and make sure you do everything you can to avoid a terrible bounce rate. This is because part of what determines your Topical Authority is your bounce rate. When people search for an answer and land on your site, how long do they stay? Do they explore more than one page? Do they bounce back off the site after the first article? Maximize your perceived relevance by pulling your audience down a rabbit hole. You need both keyword relevancy for pages and domain relevancy. Domain relevancy is the key to topical authority. This is where the classic hub & spoke content strategy comes into play. What is ‘Hub & Spoke’? The Hub and Spoke content strategy is like the floral fashion of content marketing. It’s a classic. Sometimes people forget about it. But right now it’s back in full force since Topical Authority is the next biggest undertaking. 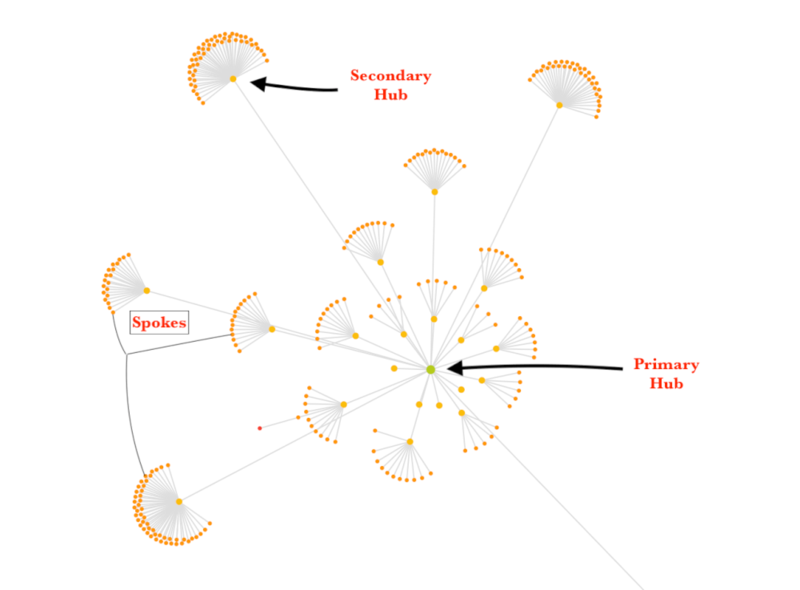 Right now you’ll see a lot of articles calling Hub & Spokes “Topic Clusters”. That’s just a new name for a tried-and-true blog content strategy. Hubs are long-form articles that give a big-picture breakdown of a big topic. You’ll use major focus keywords to decide on these. Once you decide what your major focus keywords are, you’ll create pillar posts. These are your hubs. The “Ultimate Guides” of your blog, if you will. And while the hub gives that big-picture breakdown, it introduces subtopics. Which brings us the spokes. Spokes are the supporting articles of the Hub. They dive into greater detail of the specifics mentioned in the Hub itself. The hub is a long-form post that systematically links to several spokes to drive traffic to them. This reduces your bounce rate and adds a higher level of perceived relevance to your site. It gives Google the impression that you’re an established expert on your topic, thereby giving you topical authority. Spokes can cross-link to others, but they can also link to lead magnets or products. A single hub could be about Dog Training. Let’s say you decide you want 8 spokes for your dog training article. Each of these spokes will lead the reader to yet another page – like an opt-in to a PDF version of the guide. They might also sell products, like dog crates or whistles. Or, hey can still cross-link to each other. For instance: if a reader is struggling to potty train a puppy it could be a submissive urination issue. So one article can link to the other and vice versa. If you do this, Google and its users will trust your site as the go-to for Dog Training information. Hub and Spokes content won’t change the way you write, but it will change the way you plan your blog content. This way you can have a cohesive posting strategy. One that’s designed to impress the algorithm and engage visitors under a single umbrella topic. The longer you practice SEO, the more you’ll realize that Google is no stranger to change. And if you’re going to be an SEO pro, you have to roll with the punches. That also means making educated predictions on the lifespan of a new trend. You might hear some people say topical authority will be a short-lived trend. The truth? The Hummingbird update was in 2013. It was that update that got the ball rolling on topical authority. So it’s actually just been slowly increasing in importance for years. With so many loopholes to build unethical backlinks, it was a matter of time Google implemented a fix. Now the fix is here. With that being said, topical authority doesn’t seem to be going anywhere anytime soon. If anything, it’s just getting stronger over time. If you look back in Google’s history, you’ll see it’s just repeating itself. Before Hummingbird, Google’s biggest issue it was tackling was poor content quality. There was a huge epidemic of low quality content, stuffed to the brim with keywords. The blog content users read was unnatural, spun, and often lacked substance. Google fixed that problem with the Panda update. Before that, it had an issue with spammers buying links. Site owners were using black-hat methods to rank poor quality sites by just buying their way to the top. Google fixed that issue with Penguin. If you think about it these fixes still hold true today. So why wouldn’t the relevancy fix implemented with Hummingbird? Google’s standards just keep getting tighter. Topical authority is a way of continuing to increase the quality of the user’s experience. I mention this just to say that you should stay up to date on what Google is doing. Conduct some tests your self. Pay for someone to run tests. Participate in forums where people are on the ground talking about what works and what doesn’t. The beast of a search engine only wants to show relevant, quality, ethical content to its users. So if you stay in line with that and think objectively about what your target audience perceives as relevant, quality, and ethical, you will stay ahead of the algorithm curve and come out on top. Lastly, remember to not just write for machines. Write for people.